I've got females flowers on both plants now on the main vine. It looks like I'll be pollinating on both plants between the 27th and 30th. About a week later than I would prefer to pollinate but, these will be the biggest plants with pumpkins farthest out on the main vine that I will have ever pollinated. That isn't necessarily a bad thing because if there is more plant to power the pumpkin then in theory a pumpkin pollinated later should make up for lost time. 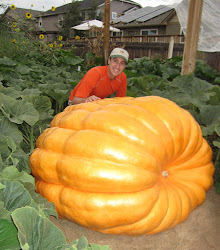 There was a fascinating thread on bigpumpkins.com in regards to cell division, when to terminate the pumpkin plant, how big a plant should be to increase pumpkin size by making it the main sink early after pollination. The ideas shared by a number of growers very interesting. I personally don't believe that a pumpkin should be terminated (i.e. all of the vine tips taken off) at the time of termination to the extent of what was shared in the articles. I think there are some other factors that should be looked at that are specific to pumpkin plants, but I think the basic premiss is correct. The thread is kind of technical, but the idea, based on a study done with tomato plants, is that basically cell division in tomatoes only goes on for about 10 days. After that the growth of the tomatoes is basically cell elongation. The study cited is pretty solid and says that you can increase the size of your tomatoes by about 80% by terminating growth at the time of pollination so that the tomato fruit becomes the main sink (or place that the energy in the plant flows to) on the plant. I think pumpkin plants are a bit different than tomato plants however. For one the growth cycle is much longer than a tomato. You are talking about 90 to 100 days of growth. I think that vines after the fruit also feed the fruit, so although cell division may have stopped, it might be that elongation may be increased with more plant. Also, there is hormonal signaling that is coming from the vine tips that is telling the plant that it is still growing which may allow the fruit to grow longer. I think also that the idea that kelp should be refrained from being used early in the season is probably also not correct. There are numerous good studies that show the increased in root mass from soil applied help. It probably is a good idea to not apply kelp around pollination time however since the Cytokine's in kelp may be inhibitory of auxins which will promote fruit growth. Although as Russ said in the thread, we may not be using enough kelp that it would have much of an effect in that way. My 1985 plant will probably be 60% terminated before the fruit at the time of pollination. I have some vines that I'll be terminating in the next couple of days and in the next week, with the current rate of growth, the majority of the vines will be terminated or near termination at pollination time.